Nina Dobrev appeared on “The Late Late Show with James Corden” to promote her new comedy series on CBS, “Fam.” (Jan. 15). She dished on her very close family and how her mother sends her gift-wrapped baby onesies and diapers to let her know that she’s ready for grandchildren. Check out the interview below. ‘Dog Days’ stars, Nina Dobrev and Vanessa Hudgens stopped by the Young Hollywood Studio to dish on their adorable new film. They also gush about their own furbabies and discuss the phenomenon of animal psychics. Nina and Vanessa even play a game of “Never Have I Ever”! Check it out! ‘Dog Days’ cast members, Nina Dobrev, Vanessa Hudgens, Eva Longoria and Adam Pally answer the internet’s most searched questions about themselves. Check it out! Nina Dobrev and her ‘Dog Days’ co-stars, Eva Longoria and Vanessa Hudgens appear on ‘Good Day LA’ to promote the film out in theaters now. Go see it! Besties, Nina Dobrev and Julianne Hough, are featured in People magazine’s upcoming ‘Beautiful Issue.’ Counting down to its debut, the magazine is releasing sneak peeks. Below, we go behind the scenes of the ladies’ photo shoot for the issue and Nina and Julianne open up about their friendship. 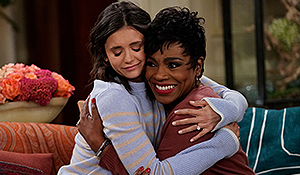 Nina explains why Julianne is practically like Nina’s “mom” and reveals how she feels about Julianne and Brooks starting a family one day. Nina Dobrev, the ambassador for the Reebok x Les Mills clothing collaboration who also helped design a #LikeNina workout sat down with People on the set of a recent photo shoot. She answered five questions we’ve all been dying to know. Check out what she had to say below. Nina Dobrev had a full day of media to promote the anticipated sci-fi reboot, Flatliners, which hit theaters Friday, September, 29th. She stopped by Young Hollywood Studios to dish on the film. Check it out!